It has been way too long since I posted on this blog and I am sorry to have been away. Fact is, it has been a long, hard winter and there hasn’t been anything to report about RVing, flying or traveling. We have spent the last few months at home just watching grandson Max grow. He will be a year old in a couple weeks. I have changed my work location and am now an urban commuter. 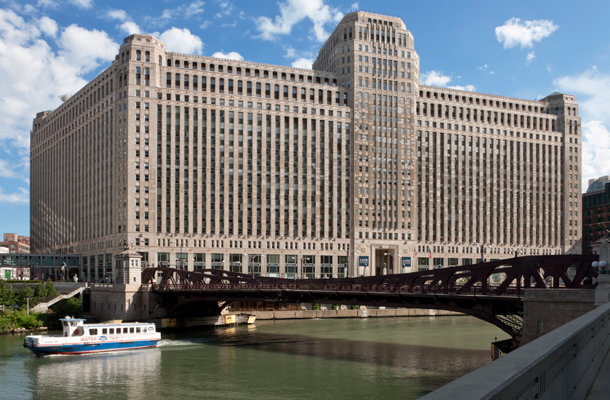 I still work for the same company but we are in the process of moving everyone from suburban Chicago to the top four floors of the Merchandise Mart in the city. So, after decades of working in the suburbs, I am now riding a train to and from work every day. My commute went from twenty minutes to two hours each way. 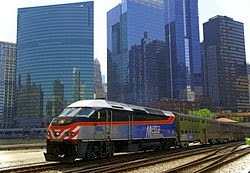 Metra operates 703 trains into and out of Chicago every day carrying over 304,000 people. Now I am one of them. It is a daily routine that I have not yet adapted to – but I am getting there. I just look forward to the return of spring and summer when my walk from Union Station to the Mart won’t include 2 degree temperatures or blowing snow. The walk along the Chicago River is probably quite pleasant when the days are as nice as in the picture. I hope to find out soon – but not just yet. The forecast is for another 3-6 inches of snow tonight and tomorrow morning. I will try to be better about posting. I have work to do in the trailer – when the snow banks allow access – and I will be writing about that soon. Spring and summer trips will be coming up to so – I will type to you all soon.